Just as Kenner did with the DC Super Powers Collection, Coleco had each figure in the Sectaurs toyline come with his own comic. (Had the line gone on long enough there would have been females as well but I don’t think it lasted that long.) In our last visit to Symbion we looked at the first one, with Dargon and Dragonflyer. For newbies, the toyline’s story takes place on a planet where scientists made a huge oopsie and mutated the planet, turning the people into insect-like beings, supersizing the insects and making them psionically linked with these “Sectaur” people, and basically ruined the planet. Now two sides fight over remaining laboratories, or as they call them “hives”, for control of the planet, Dargon leading the Shining Realm where all the mostly human people live, and Spidrax leading the forces of the more insect-like Dark Domain. Unlike the cartoon, the comics do not have Spidrax as leader, but leader of the forces under Empress Devora. 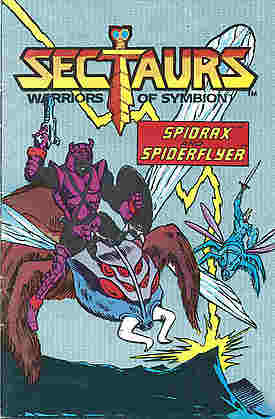 The second comic stars Spidrax and his mount, a winged spider fittingly called Spiderflyer. Like Dragonflyer (who at least is actually a mutated dragonfly), Spiderflyer the toy was a puppet with a seat for his Sectaur to ride. In all the line had four of these, two in the air and two on the ground, the rest coming with smaller partner Insectoids. Although this story focuses on the villains I don’t think they’re going to get off any more victories than the DC Supervillains, but we’ll see. There are no credits for this comic (or at least not seen in the scans over at Sectaurs.com, where you can follow along) so I’ll show you the cover and dive right in. And somewhere in the distance insect Captain Marvel is born. We open in the Dark Domain as the Empress’s stepson, Skulk, is trying to convince the sorceress Scorpia (popular villainess name isn’t it?) to help him find more hives. In a story that either came from the Marvel comics run or was never chronicled, one Hive was found and it nearly caused disaster, but everyone still wants to find more. Symbion is a planet where they don’t just double-down on stupid, they quaduple-down. Everyone wants science stuff but even the scientists couldn’t handle their own science so what chance do these guys have? Scorpia acts like she’s using magic but Spidrax, her half-brother who walks in just as Skulk is making his plea, knows she just has a bit more knowledge of science than most, which we see later is shared by the Shining Realm’s Mantor. Neither of them are the best scientists in the world but nobody’s mistaking them for David Copperfield or Galdalf unless they’re idiots. I should mention Skulk is an idiot. In typical 80s villain fashion, Scorpia isn’t going to give away any locations she can’t profit from but Spidrax takes her “magic” compass anyway, which should point to a Hive. He takes off on Spiderflyer and heads for a dangerous storm. During that last Hive encounter such a storm was started so it seems like a good place to start and the compass is pointing that way. However, Dargon and Mantor don’t need a compass when the storm will suffice. They’ve arrived in the same location because the thunderclouds are making a lot of lightning hit one particular spot. Maybe it’s just where its girlfriend dumped it and it’s the raging type? Here we get exposition that Dargon’s father also went looking for Hives and never returned. There’s a surprising amount of lore in this mini-comic. You have the empress’s stepson, which means she married someone and still has his offspring running around being a dope, and Dargon’s father disappearing on a quest similar to the one Dargon is on now. This last one gives you some idea as to how long the planet’s been in this state if Dargon’s father was able to go on one of these quests. When we watched the cartoon some time back I got the impression that it was fairly recent, like in the past few years at most. Spidrax and Spiderflyer of course run into Dargon and Dragonflyer in the storm. Fighting happens because it wouldn’t be much of a story if it didn’t, even at 16 pages. 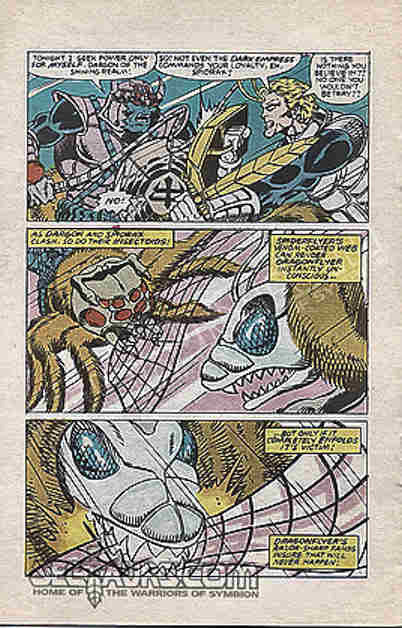 The fight sets up Spidrax’s character, that he’ll gladly betray anyone including the Empress if it means seizing more power for himself, as well as Spiderflyer’s poisonous web that kids have to pretend the puppet with battery-powered flapping wings is able to produce. Dragonflyer manages to stop the web with his teeth, which would ordinarily be a bad move for anything poisonous but apparently it only works if Spiderflyer manages to completely cover you first. Because that’s how poison works. Science really is messed up on this planet. For one thing the lighting is not coming from the clouds but from the ground below. It also doesn’t discriminate and zaps all four combatants. That’ll wreck your day. It’s a metaphor for social media. In that everybody’s fighting. All four wake up on the ground merely stunned because that’s how lighting works. Not that these two realize how science works (partly for obvious reasons) since they assume that it isn’t another underground Hive causing the problem but somehow the plants on the hill creating the lighting in proximity to the storm clouds. They don’t even stop to consider WHY the flowers are spitting lighting and just decide to call it a loss and go home. Spidrax leaves the supposedly useless compass behind, which they don’t see pointing straight down under the hillside to damaged electrical equipment. It’s their energy being absorbed by the plants that turn them into reverse lightning rods when the storm clouds come by. Did I mention science is screwy on Symbion? This was a pretty good comic. You have worldbuilding, always good to hook the kids into your toyline, and character development, good to hook your kids on particular figures. The art is also rather good. This should be an interesting series to return to. The next one will focus on Skulk and his puppet mount. What kind of wacky hi-jinks will we see then? We’ll have to wait until it comes up in rotation. According to my list next should be Starriors but I still can’t find scans of those minicomics, and I just found out there’s another one I need to look into from a toyline I don’t even remember, Legions Of Power from Tonka. The list keeps getting longer even if I can’t always fill it. So next time we’ll be returning to the aforementioned Super Powers Collection. Now I’m wondering how many other promo mini-comics I don’t know about? Posted by ShadowWing Tronix on January 4, 2019 in Free Comic Inside and tagged comic review, Dragonflyer, Free Comic Inside, mini-comic, Minicomic, Prince Dargon, Sectaurs, Spiderflyer, Spidrax. If you enjoy the Sectaurs mini-comics, then you should also like the full size Marvel Sectaurs comic books. I have two of those issues, and they are interesting to read. Artwork is very much on point too. I have all four Starriors issues, but I had no idea that even that had mini-comics! But lots of companies liked to create mini-comics or comics to promote themselves and/or their products back in the 1980s. For instance, I can remember getting a Big Boys Abdow comic book when as a kid, my family went to the Big Boys Abdow restaurant (the national restaurant chain with tasty cheeseburgers that had a giant statue of Big Boy in front of their restaurants). Those Big Boy Abdow comics were always free as long as you ordered food from the restaurant.